We’re still in the dog days of summer and summer vacation is in full swing – kids are in camp, summer hours are in effect at the office and it’s hot -- real hot. If school starts after Labor Day there is still one month left of summer for the kids. So why am I seeing first day of school photos all over my social media accounts already? It seems like school starts in August ,or even July, in many parts of the country. Here in the northeast public school starts September 8th but most charter schools kids have either started school this week or will be headed back in the next week or so. It's back to school time for some but not for others. When it comes to independent schools most, if not all, begin after Labor Day, the official end of summer fun. For the thousands of kids in pre-k this year who’s parents are considering private school for kindergarten the time to consider applications is now. Applying to one of these schools is a multi-step process that involves completing written or online applications, screening tests, school tours, separate parent and child in-person interviews and financial documentation (if requesting financial assistance). 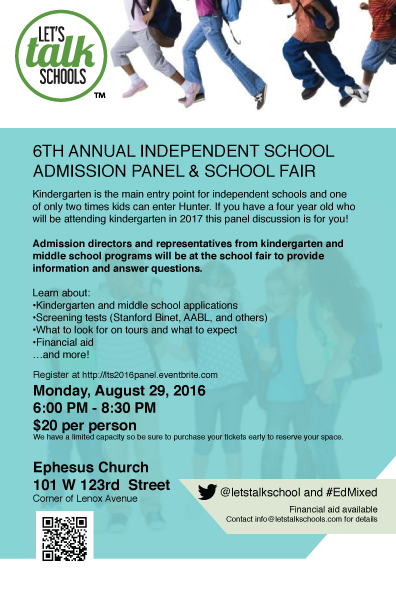 Our annual kindergarten admissions panel & school fair is a one-stop shop where you can meet admission directors and gather all of the information you need for a successful application. Some schools stop accepting applications early once they’ve reached a maximum number so getting an early start puts you ahead of the masses. The event takes place Monday, August 29, 2016, 6pm at Ephesus Church, 101 W 123rd Street. You don't want to miss this! Uptown’s premier summer camp fair is back!